Last New Year’s Eve, my children awoke to find balloons taped to the living room wall. Each one had a time written on it. 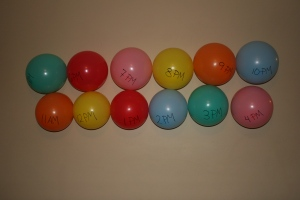 Every hour, on the hour, they popped one balloon, excited to see what message was hidden inside. We had all manner of activities listed inside the balloons, from playing a board game, making a treat, running around the house banging pots and pans, to taking pictures (for which I handed out band-aids with mustaches for everyone to wear). It was a major hit, and our kids asked for this to become a new tradition. They are curious as to what activities I might come up with this year. What fun New Year’s traditions do you do with your children? This has been edited from a post previously published at Living Peacefully with Children. That is so fun! We may have to copy you! So far we haven’t really made any New Year’s Eve traditions except to drink sparkling juice in plastic cups that look like champagne glasses, lol. Oh and we celebrate New Year’s when it turns midnight in St. John’s in Canada (2 and a half hours ahead of us) because we don’t want our preschooler up all night and we figure if it is New Year’s Day in the Americas, that is close enough for us!